The 1974 book was Six Days of the Condor by James Grady. The 1976 film was 3 Days of the Condor with Robert Redford. Now the 2018 TV drama is a 10 parter, simply named Condor. Updated to a contemporary setting, the heart of the story is still the same: a CIA employee on the run from baddies, when he no longer knows who to trust. Yes, this could have been a 24 series, if it had a ticking clock. That said, there’s a lot to like about what we are left with. 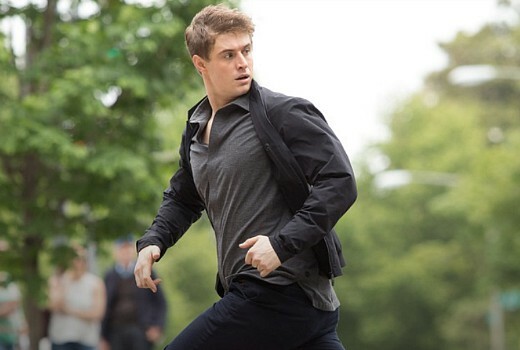 Joe Turner (Max Irons) is a handsome, gifted analyst who has designed a program to identify persons of interest before they act (wasn’t there a whole show devoted to that? ), based on an algorithm. As the series opens that’s about to be put to the test when CIA suits Bob (William Hurt) & Reuel (Bob Balaban) are faced with a suspect taking an unknown package to a packed sports stadium. Can his code be trusted? Do they shoot the man or risk thousands of lives? “We want to hear every aspect before we act,” Joe is told. “What would you do if this was your play? I won’t spoil the outcome, even though strictly speaking it is still part of the story set-up. Meanwhile Joe’s private life depicts him as a lone wolf, who is set-up on a blind date with Kathy (Katherine Hale). Things don’t go well. But life is about to get much worse when masked assailants take out his co-workers in an absolute bloodbath. Although Joe escapes there are those in the CIA who believe he is responsible. Unsure whether to trust best mate Sam (Kristoffer Polaha) -or anybody for that matter- Joe is on the run dodging bad guys at every turn. The other key subplot in the series surrounds disenfranchised dad Nathan (Brendan Fraser) whose hatred for radical Islam sees him engage in perilous, fatal steps involving forces greater than his own. UK-born Max Irons (The Riot Club, Red Riding Hood, The White Queen) steps up as the lead of this engaging spy thriller. Boyish and charismatic, he wins audience sympathy as a man pinned for a crime he did not commit. William Hurt underplays his role as a CIA official keeping the faith in Joe, if sometimes with a sleepy delivery of his dialogue. Brendan Fraser, in a follow-up to his thug prison guard in The Affair, continues to find darker roles since shedding his Hollywood pin-up image. Three episodes of this was an easy-watch, which is saying something. It moves with some momentum and layers its characters with more shades of grey as it advances. Whether 3 Days is a better fit remains to be seen, but at least 10 isn’t the full 24. Condor premieres Thursday June 7 on Stan.